I am starting this article at Boulogne-Billancourt in the suburbs of Paris just hours after watching Rafael Nadal win the Men’s single title at the French Open Tennis Championships for the 11th time in the last 14 years. Of all the sports played in the world today I think that Tennis has a very strong claim for being the home of not just the world’s most pre-eminent sports personality Roger Federer, but also the sporting world’s two finest exponents of sportsmanship in Federer and his nemesis Rafael Nadal. Both are household names known the world over and tennis is fortunate that, unlike the past and present poster children that represent many sports (Lewis Hamilton, Tiger Woods, Cristiano Ronaldo, Floyd Merryweather, Kobe Bryant etc. ), both are exemplary role models who always respect their opponents and represent their sport with dignity. 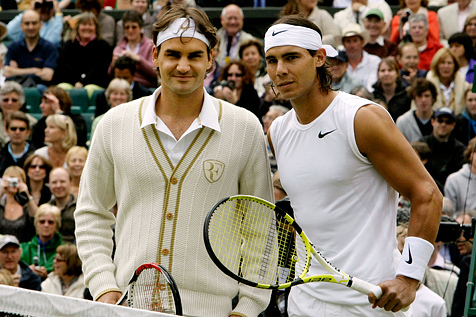 The rivalry between Roger Federer and Rafael Nadal is one of the greatest ever in the history of sport, let alone tennis, and is known as Fedal, because their achievements in tennis are both unmatched and inseparable. 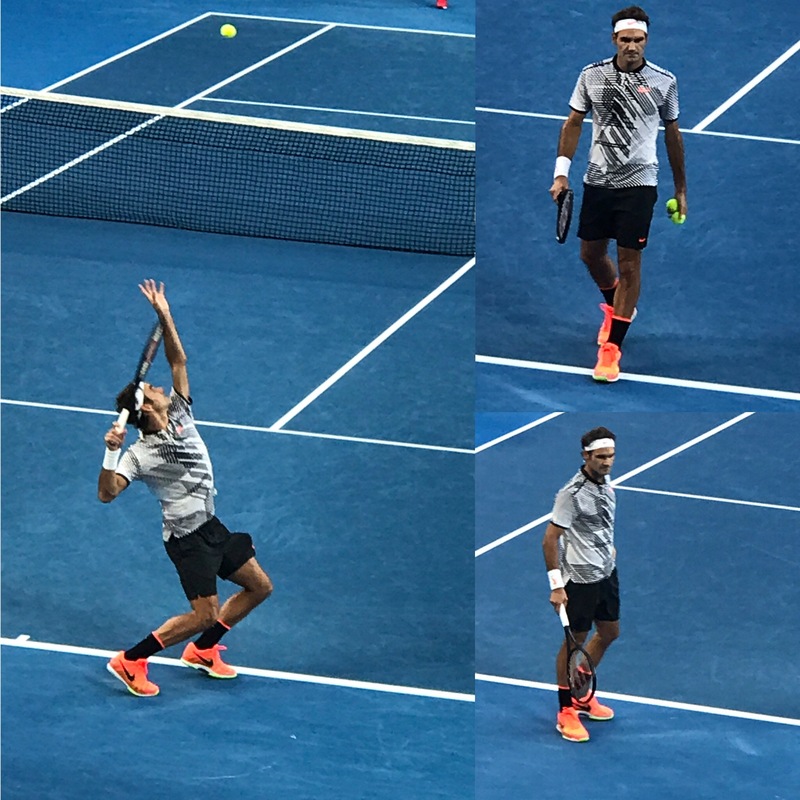 However the term Fedal only came more widely known when the Australian media adopted it to describe the extraordinary and simultaneous renaissance of their careers at the Australian Open in January 2017, an event I was fortunate enough to attend. 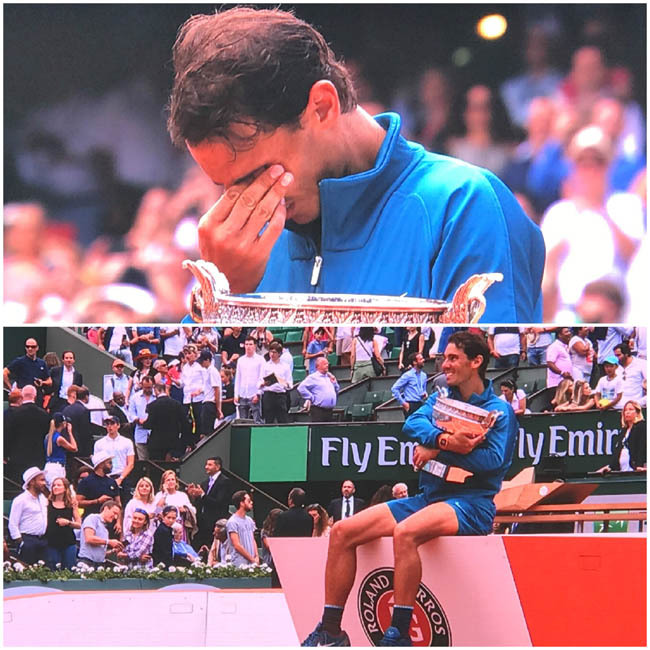 And now, almost 18 months later, Rafa Nadal’s achievement to win the French Open for an 11th time is something that has no parallel in any sport. 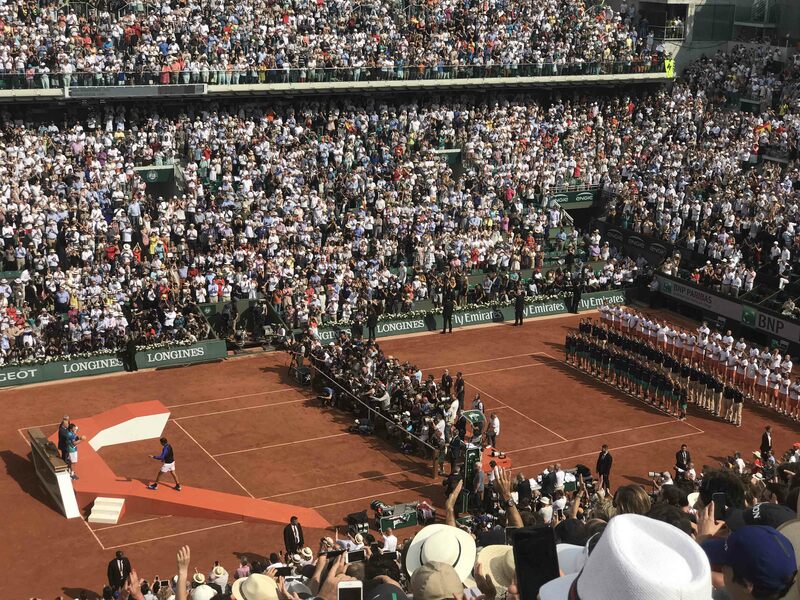 Each year in the last week of May, 128 of the world’s top players gather in Paris at Roland Garos and for 11 of the past 14 years Rafael Nadal has triumphed. 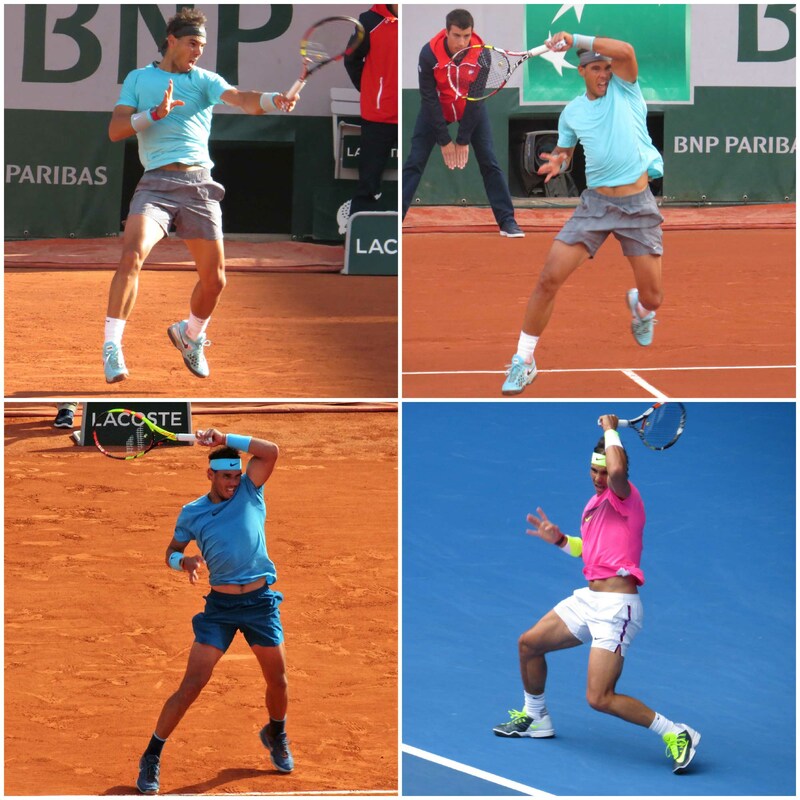 In 2016 he had to withdraw because of injury so over the last 14 years Nadal has played 88 matches and triumphed 86 times on the Red Clay of Roland Garos. His record in the Final is 11 appearances and 11 wins! These are truly staggering statistics which we will return to later, but first let me to turn the clock back to January 2017 and the Australian Open Tennis Championships in Melbourne. At that time Federer and Nadal were 35 and 30 respectively. They were the holders of 17 and 14 Grand Slam Championships respectively and were the two pre-eminent members of an elite group of 4 players, together with Novak Djokovic and Andy Murray, who had dominated Tennis for almost 15 years, winning all but 5 of the previous 44 Grand Slam Events (Wimbledon and the Australian, French and US Opens). But in truth, Rafa Nadal had not won a Grand Slam since the 2014 French Open and for Roger Federer it was almost five years since he had triumphed at Wimbledon in 2012. 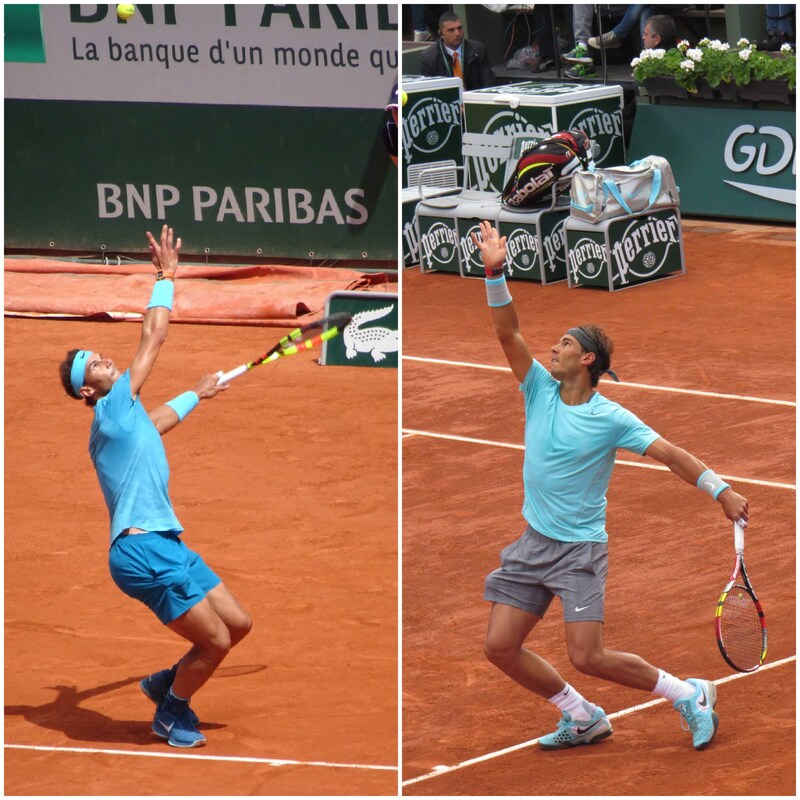 This was a far cry from the years 2004 – 2010 when between them they had won 24 of the 28 Grand Slams on offer and most tennis observers felt it was highly possible neither would triumph again in one of the four major Grand Slam tournaments. Indeed, it was Novak Djokovic who was subsequently the dominant force in tennis, winning 11 of the 24 Grand Slams in the previous years 2011 – 2016 and as both Federer and Nadal struggled with the challenges of injury and/or increasing age, tennis tennis looked well set to be dominated by the two younger members of the big four, Novak Djokovic and Andy Murray, and 2016 had not been a good year for Federer or Nadal. For Roger Federer, who has had a relatively injury free career, 2016 was the first year since 2000 when he had failed to win a title and after reinjuring his knee in his Wimbledon semi final defeat to the Canadian Milos Raonic, he did not play a tournament until January and his ranking had fallen to 17th in the world. For Rafael Nadal, 2016 had also been a disappointing season as he struggled with a wrist injury. It was a year where he failed to reach any of the Grand Slam Quarter Finals for the first time since 2004 and he had not played since November, before playing the Brisbane International tournament in January 2017 as a warm up for the Australian Open. Nadal was seeded 9th and Federer 17th and as it happened on opposite sides of the draw, but what was to follow in the tournament was totally unexpected , captured the imagination of the sporting world and has both set a new (or rather renewed!) template for Men’s Tennis and rejuvenated and transformed the careers of both Federer and Nadal. 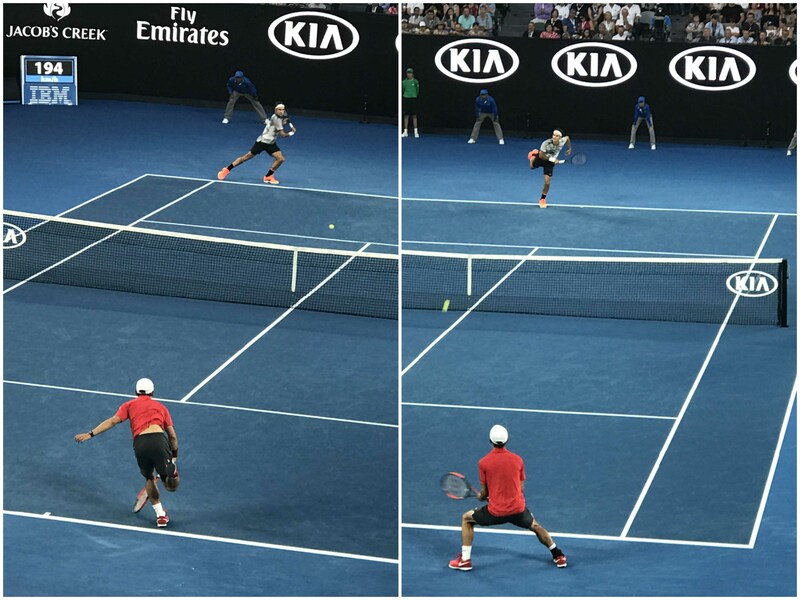 When the January 2017 Australian Open Tennis began the two favourites were Novak Djokovic, the record holding six times winner, and Andy Murray, five times the runner up, but both were eliminated before the Quarter Finals, Djokovic lost in the second round to Denis Istomin and Mischa Zverev had ambushed Andy Murray in the 4th round with a now unusual but very effective serve and volley game. 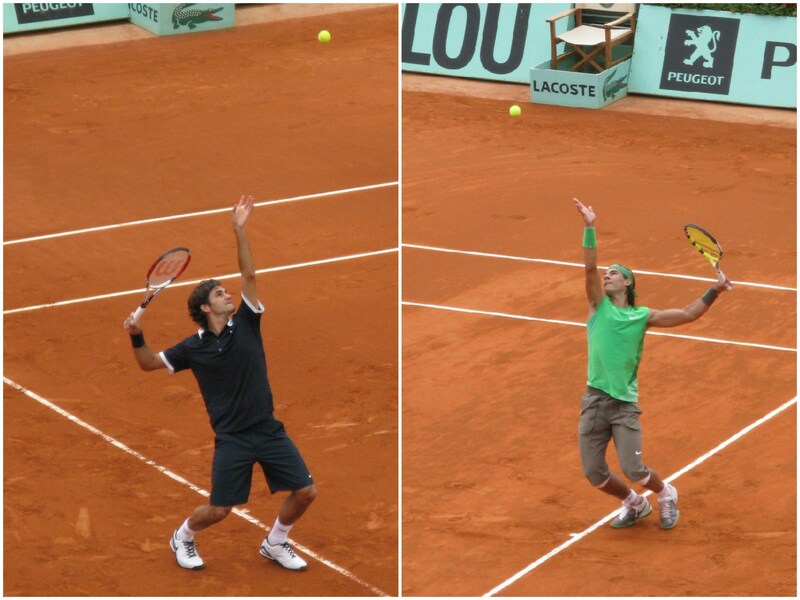 And meanwhile both Federer and Nadal were making steady progress through the early rounds to reach the Quarter Finals. I say steady progress but Nadal had been pushed to the limits in his third round to come from behind and win in 5 sets against the young German ‘Sasha’ Zverev, widely considered to be the best of the young players on the tour and a future Grand Slam Champion. We had tickets for the last 12 days of the AustralianOpen and when I saw that Federer and Nadal both appeared fit and in form, I backed both at generous odds early in the tournament. 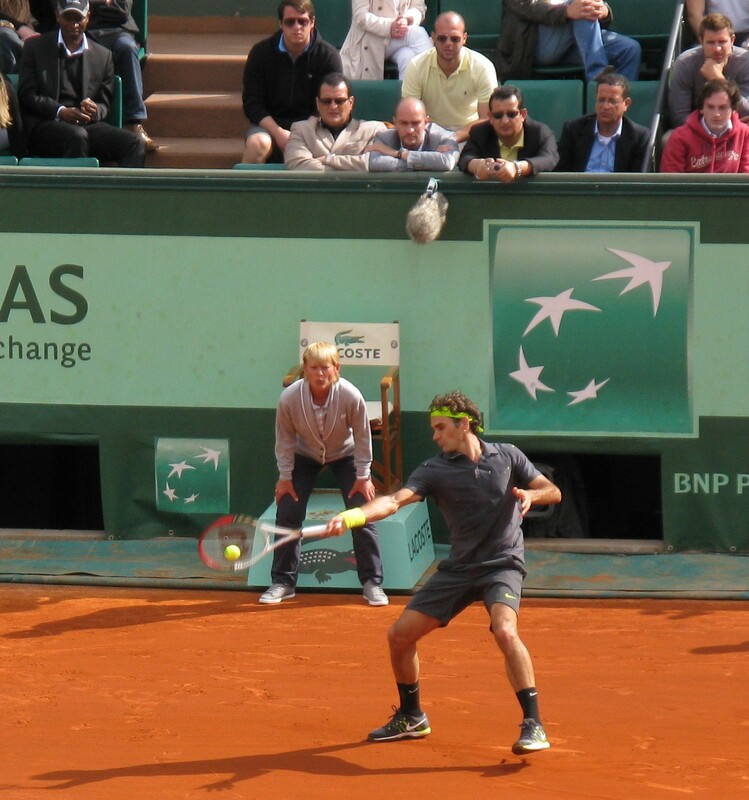 I have seen a lot of Federer in recent years and as long ago as 2012 in an article that I wrote about Roland Garos which you can find here ,I predicted Federer’s days of supremacy were done and he would not win any more Major championships. I thought I was ‘almost’ correct because, although he did win Wimbledon a month later in July 2012, his trophy cabinet was lacking any additional grand slam titles thereafter, but the events that unfolded in Melbourne and thereafter were to prove me very wrong! And for me the first signs of that were in his third round match, where Federer totally demolished the infirm and former Wimbledon finalist Thomas Berdych with an almost error free performance, combining powerful serving with impressive ground strokes and no evidence of the errors that had increasingly crept into his game in recent years. For the first time in years I thought Federer in that form looked a real chance in a Grand Slam Championship and made another bet on him. By the time we got to the Quarter Finals I was telling friends this was the most open Grand Slam event in memory and it was still 3/1 the field with Federer, Nadal, Wawrinka and Raonic all priced between 3/1 and 5/1. I thought Nadal was a little fortunate to emerge victorious from his four set match against a resurgent Gael Monfils in the 4th round. It had also taken Federer 5 sets to get past the ever dangerous Kei Nishikori, a nice player but one who too frequently flatters to deceive. There was speculation in regard to whether Milos Raonic could finally break through and win his first Grand Slam event, whether the ever popular Wawrinka (the ‘Stanimal) could win a second Australian Open and even………………..was it possible that there could be a Final between arguably the greatest two tennis players of all time – Federer and Nadal. And if the term Fedal was not born in Melbourne, then this is when it began to be more frequently heard in public use. And whilst the uninitiated might say ‘same old same old’ in regard to another Federer Nadal match up, the fact was, although they had previously met 8 times in Grand Slam Finals (with a 6-2 advantage to Nadal) it was five and a half years since they had met in the final of the 2011 French Open. The prospect got closer after the four quarter finals when Nadal faced what I considered to be his toughest test against the Canadian Milos Raonic, seeded 3rd, who had just weeks earlier defeated Nadal in the Quarter Finals of the Brisbane International. However all four quarter finals were won in straight sets 3-0 and as I had bet on that very result on each match this was rapidly turning to be perhaps the most profitable tennis tournament I had bet on in recent years. But more importantly this set up a two very tasty semi finals. Roger Federer was due to face his fellow compatriot and long time friend Stan Wawrinka whilst Rafa Nadal was due to play Gregor Dimitrov, another of the Pretenders trying to win his first Grand Slam event and try and end the almost total dominance the big four had exercised over the Grand Slam events for the past ten years. Because of his classical style of play Dimitrov has often been described as ‘Baby Federer’ and considered a Champion in waiting. Dimitrov had never been in better form and was the recent winner of the Brisbane International, which had attracted a strong field. He was particularly impressive in his quarter final defeat of David Goffin, displaying very sound defence with impressive shotmaking. The Australian Open is always described by players and fans as the ‘friendly Open’, perhaps as it combines easy going Australian hospitality with efficient organisation and, unlike Wimbledon, which refuses to join the 21st century, tickets are always accessible and can be bought 6 months ahead so one can properly plan a trip. It is the only one of the four Grand Slams that has three Arenas with retractable roofs so there is little disruption because of weather, although the heat can be a challenge some years. And whilst no sympathy is required or expected, 12 days of two sessions a day of tennis (as I booked for 2017) can be quite tiring, especially when matches can often continue to midnight and then we had to leave, walk a mile to the nearby Airbnb apartment, grab a few hours sleep and then get ready to return for the next day’s Day session. We were frequently not back at our apartment until 1am and on one occasion it was almost 2am when play came to an end as one long match followed another! And Yes, sometimes one boring match may follow another and it all blends in, to the extent that some days it is almost impossible to remember who we had been watching the previous days. 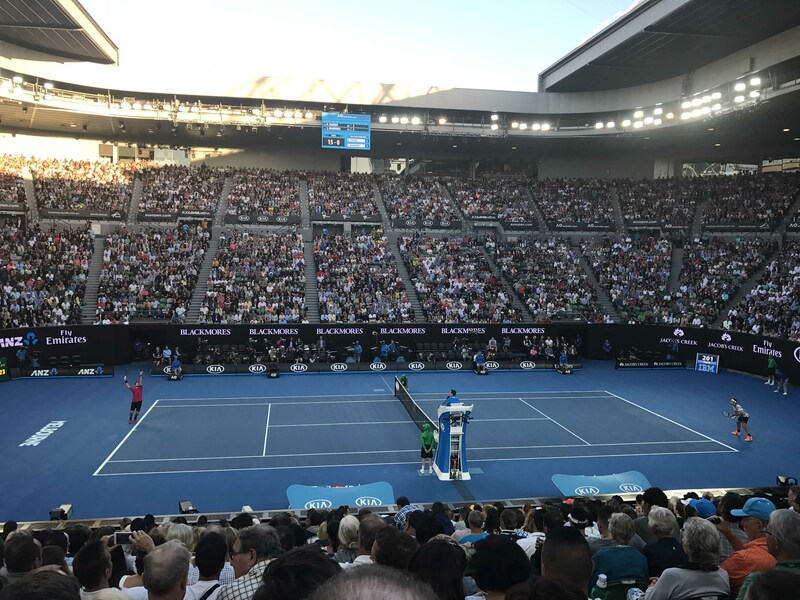 But the 2017 Australian Open was widely considered by commentators to be one of the best Grand Slam tournaments with some high quality matches in both the Men’s and Women’s tournaments and the semi finals certainly did not disappoint. I had backed Wawrinka to win his quarter and reach the semi finals and he has long been my favourite player – partly because he was so long in Federer’s shadow as the Swiss number two, before developing into one of the few players able to challenge the big four on a regular basis and partly because his single handed backhand is to me the best shot in Men’s tennis. Wawrinka and Nadal have always been my favourite payers. I think everyone likes Wawrinka as he just looks and behaves like a regular guy, indeed he looks like someone has just dragged him out of a pub or bar, handed him a racquet, shirt and a pair of mismatched shorts and said ‘Hey do you want to have a go at this’. Like everyone else, I am a big fan of Federer and a great admirer of everything he has both achieved in tennis and given back to the sport. But on this occasion my heart was with Stan and Rafa so I sold my bet on Federer to win the tournament for a good profit and made another bet on Rafa. The Press was now full of stories about another Fedal final in a Grand Slam – certainly something that no one saw coming when they started the tournament seeded 9th and 17th! 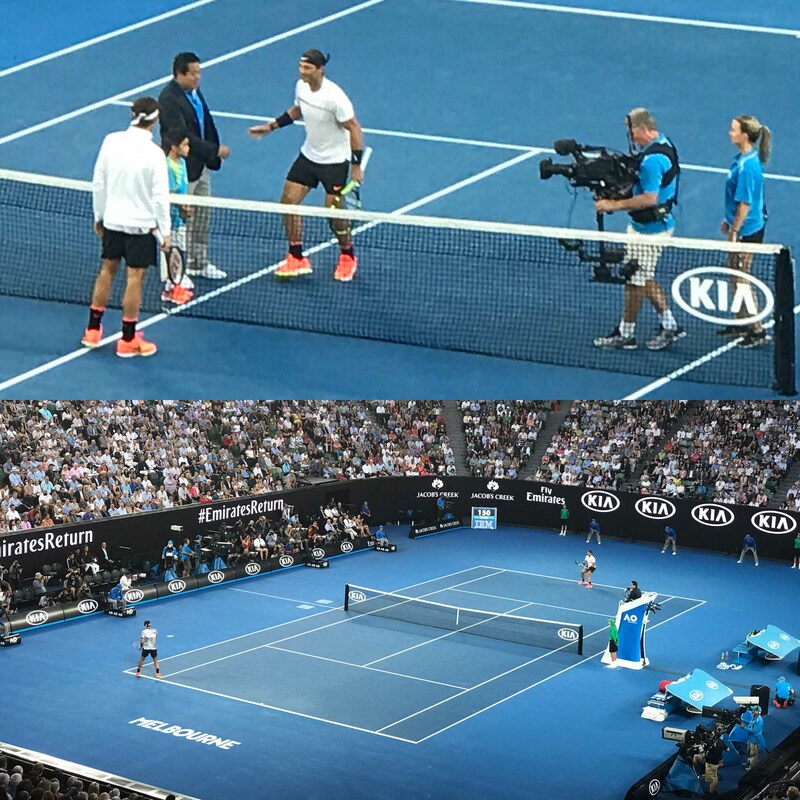 The semi finals did not disappoint and both went to five sets with Federer finally dispatching Wawrinka in a match full of interest but never a classic but the Nadal – Dimitrov match up was one of the matches of the year and indeed a match for the ages. I doubt if Dimitrov has ever played better as he went toe to toe with Nadal and in turn drew the very best out of Nadal. 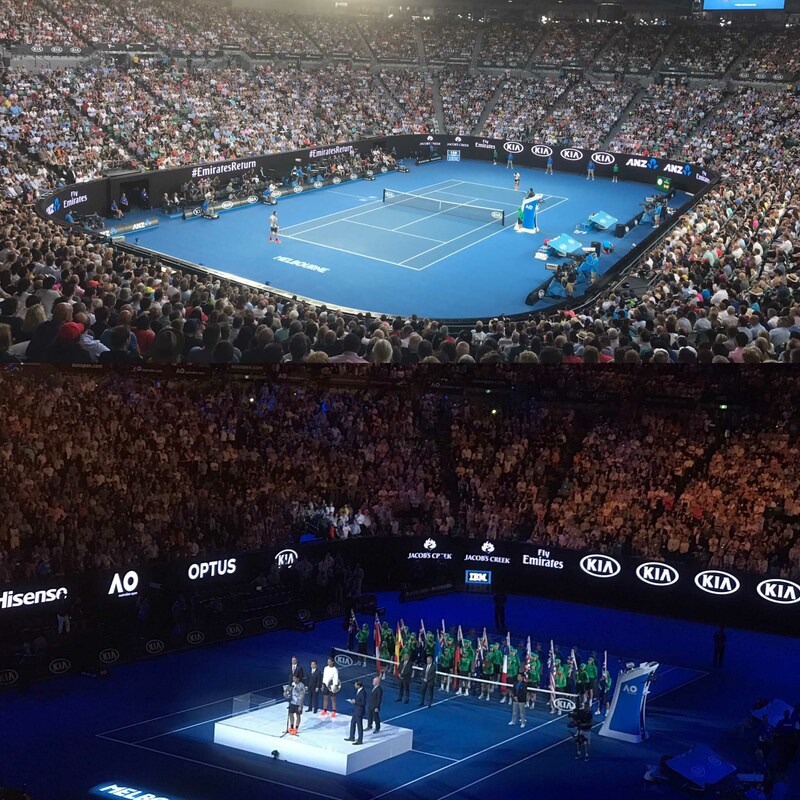 This has easily been the best tennis tournament I have ever attended and it was a real privilege to watch the titanic battle between Dimitrov and Nadal last night here in Melbourne – it took almost 5 hours of really high quality tennis before Rafa prevailed. We have had two incredible semi finals but last night was quite outstanding with both players on top of their game. It was one of the most exciting and compelling final sets I have ever seen with both players holding their nerve and surviving multiple break points – notably Nadal from 15-40 when serving at 3-4. He played two titanic points when losing, either would have had Dimitrov serving for the match. The first two games of the final set alone took almost 20 minutes. I don’t think there is anyone else in Sport who can match Rafa Nadal for determination, resolve and nerves of steel under pressure. He also won a few hundred pounds for me by making the final to add to what has been the most successful betting fortnight of my life! Yesterday’s Federer Wawrinka five set semi final was excellent, but today’s was constant quality on almost every point. I can see why they called him ‘BabyFed’ and in that sense it was a great prep for Nadal in regards to tomorrow’s Fedal final. I think Rafa will be too strong for Roger in the final. I certainly hope so, as I also backed him to win the tournament as well as to reach the Final! It may have been that I understated just how good the match was as John McEnroe stated it was one of the best matches he had ever seen and it was no surprise when, at the end of 2017, most tennis commentators nominated it as the best match of the year. Dimitrov’s wait to reach a maiden Slam final continues after Nadal, 30, inflicted his first defeat of the year. Nadal, who is attempting to win a 15th major title, will face Swiss rival Federer, 35, in Melbourne on Sunday. 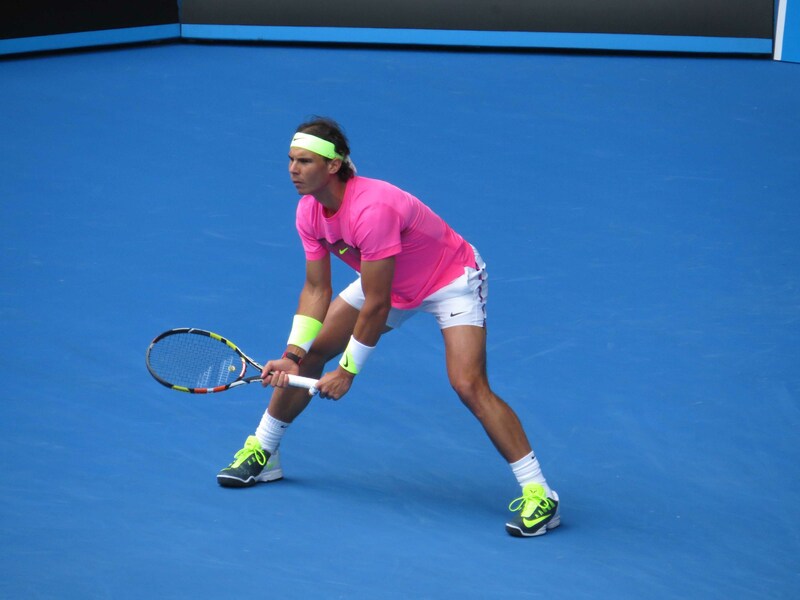 “I never dreamed to be back in the final of the Australian Open,” said Nadal. He will meet Federer, who needed five sets to beat compatriot Stan Wawrinka in Thursday’s first semi-final, in Melbourne’s Rod Laver Arena at 08:30 GMT. As well as an extra day’s rest, 17-time Grand Slam winner Federer spent almost two hours less on court than Nadal during his semi-final, having beaten Wawrinka in a comparatively quick three hours and five minutes. Twenty four hours later, both Nadal and Dimitrov showed incredible endurance in a match during which neither man looked like wilting. Eventually the 25-year-old Bulgarian buckled first – losing his serve at 4-4 in the deciding set – as Nadal wrapped up victory with his third match point at almost 00:45 local time. 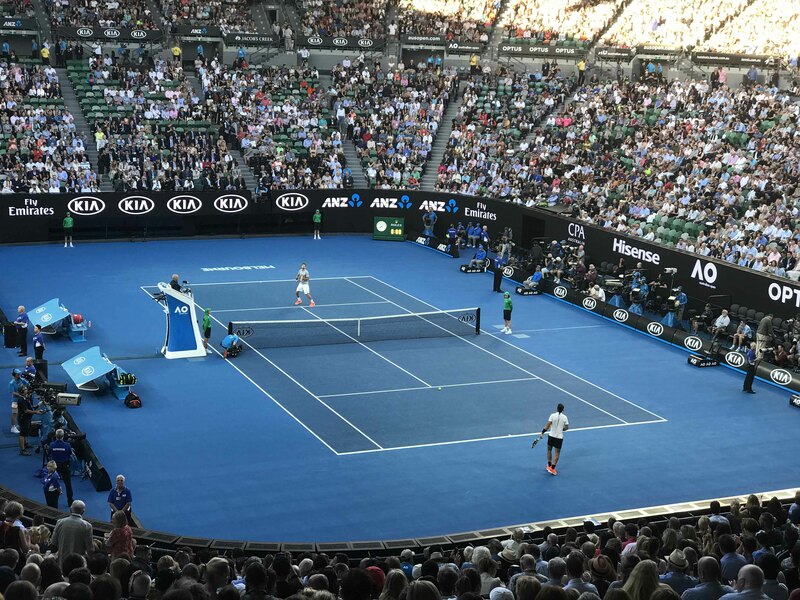 Nadal dropped to his knees at the baseline in celebration, bringing a charged Rod Laver Arena to its feet, when Dimitrov sent a forehand long. Once dubbed ‘Baby Fed’ for his similarity in playing style to Federer, he showed enough against Nadal to suggest he will end that unwanted record soon. However, it is difficult to pinpoint what more he could have done. Dimitrov showed he has the tools needed to compete with the best players – thumping down 20 aces to Nadal’s eight, cracking 79 winners to Nadal’s 45 and showing extraordinary defensive resilience. It was still too little against an inspired Nadal. Much of the talk before Friday’s second semi-final centred around the prospect of Nadal meeting Federer for the ninth time in a Grand Slam final. 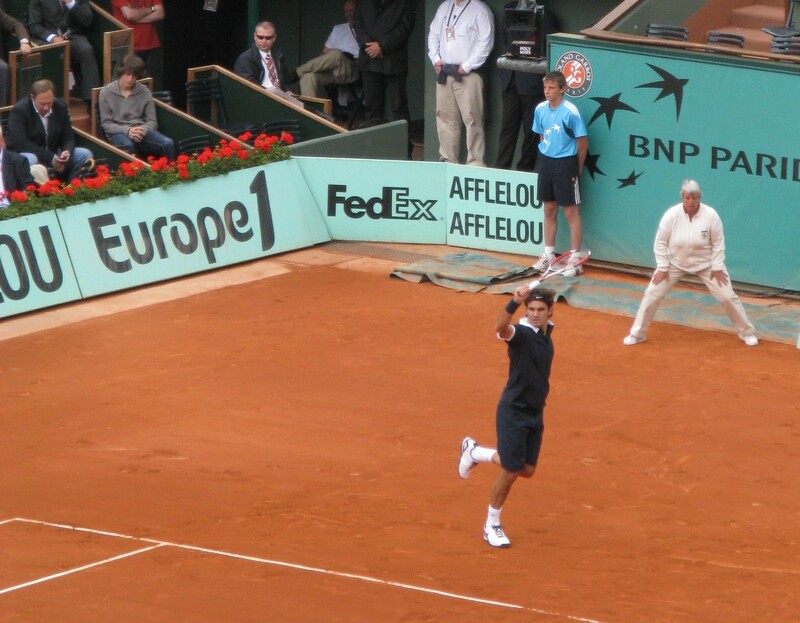 The pair dominated the men’s game between 2004 and 2010, before Novak Djokovic’s emergence, and have provided many memorable duels over the past 13 years. However, few would have suggested a fortnight ago they would be reunited in the first major final of 2017. Federer is making his competitive return in Melbourne after six months out with a knee injury, while Nadal has also struggled with form and injury over the past couple of years. I thought Nadals performance had been outstanding. He has always been able to sustain a rally with power and accuracy for longer than anyone else and as Dimitrov had discovered when Nadal is in the zone it always takes an outstanding winner to take a point away from him. And that was why I thought Rafa Nadal would best Roger Federer in their long anticipated Melbourne showdown. But not for the first time I was wrong, because two days later in another enthralling five setter that went back and forth, Nadal came from two sets to one down to level the match and enter a fifth and deciding set. When Nadal led by a break in the fifth set it looked as if history was about to be made and he would become the first player to win all four Grand Slams twice in the Open era but there was one final twist to come which saw Roger Federer prevail. Nadal was leading 3-2 15-0 with a break in the final set when he had an open court winner and smashed it in the net. Instead of 30-0 it was 15-15 and on the next point he had an unlucky net cord against him, lost his serve and never won another game. I was pleased for Federer who has given so much to tennis and whose decision to keep playing the game he clearly loves was totally vindicated but felt sorry for Nadal. Indeed Federer said in an interview with Channel 7 that he had been lucky and had pick pocketed the match from Rafa who should have won. But history and results is not based on ‘what ifs’ so in the most unlikely and unexpected fashion, after a 6 month break from the game, Roger Federer achieved what he had been striving to attain for almost five years – an unprecedented eighteenth Grand Slam. No one and not least Roger Federer had seen this coming when he was entering the tournament seeded 17th and having not played competitively in the previous 6 months. He had earlier admitted he would be well pleased with making the quarter finals. For years commentators and observers had asked him when he was going to retire and he always replied that he was still getting to the business end of major tournaments, he was still ranked in the top five in the world and he still believed he could win additional Grand Slams. He had always made it clear he still loved playing tennis so saw no reason why he should stop when he was still competitive. I was one of the many who could not see him winning another Grand Slam but he had managed it and against his long standing rival and the most difficult opponent possible. And in so doing Federer became the first man to win three separate Grand Slams five times and now Nadal has twice been just a few points from becoming the first man in the Open Arena to win all Slams twice as he had also been a break up in the final set against Novak Djokovic in 2012 in what at almost six hours was the longest Grand Slam final ever played. So Melbourne 2017 was all about Fedal and the unlikely renaissance of two aging superstars whose best years most people thought were long behind them. But what no one realised or expected was that Fedal was to be much more than one magnificent Tennis tournaments when the Tennis Gods and stars were all aligned to provide one memorable match after another as well as not one but two most unlikely come back stories. Melbourne 2017 was in fact no more than an introduction to an even more unlikely story and a mini era of dominance that is still continuing 16 months later! 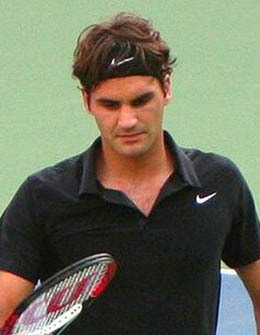 In the two months following his triumph in Melbourne, Roger Federer could not have done more to emphatically show that his Australian Open was no fluke by winning the two Masters 1000 tournaments in Indian Wells (sometimes dubbed the 5th Major because of its duration and the depth of the field) and Miami. And in doing so he had two additional victories over Rafa Nadal. 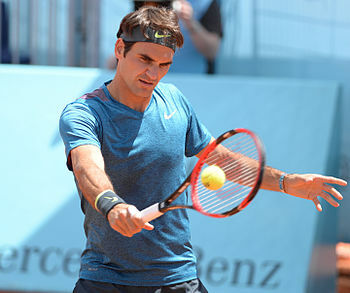 Federer then announced that he planned to continue playing for at least three more years as long as he remained free of serious injury but at 35 he needed to be more selective, so he was not going to play the Clay court season in April and May which is physically demanding and not suited to his game. The benefits of a break pre Australia had obviously not gone unnoticed to Federer and his coach Ivan Ljubicic and they were also pragmatic enough to realise that the resurgent Nadal was going to be hard to beat on his favourite Clay surface and they were to be proven right on both counts. 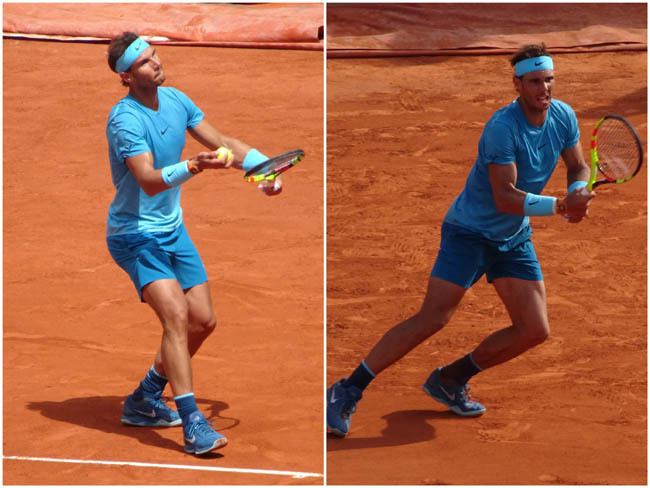 Nadal won the big clay tournaments at Monte Carlo, Barcelona and Madrid before a surprising defeat to Dominic Thiem in the Italian Open conveniently gave him the best part of two weeks to recharge before the 2017 French Open. 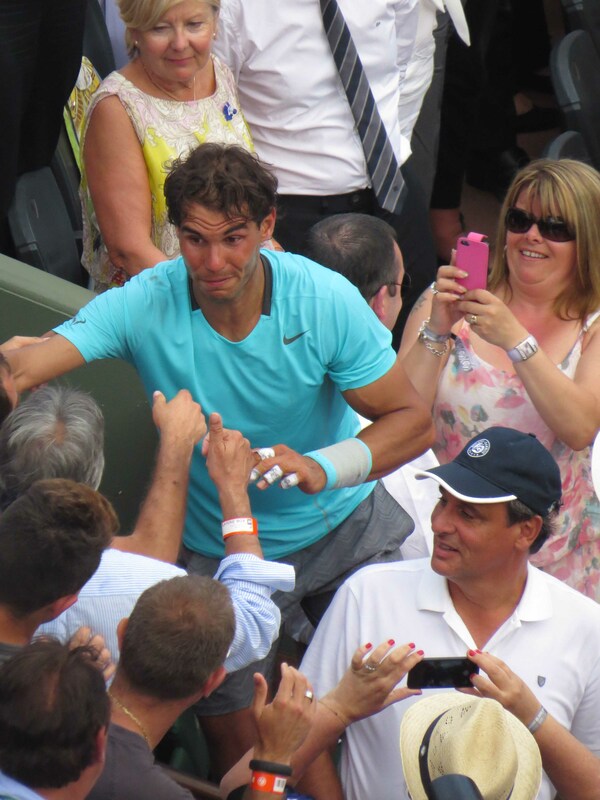 At Roland Garos Nadal was not only unbeatable he was imperious. 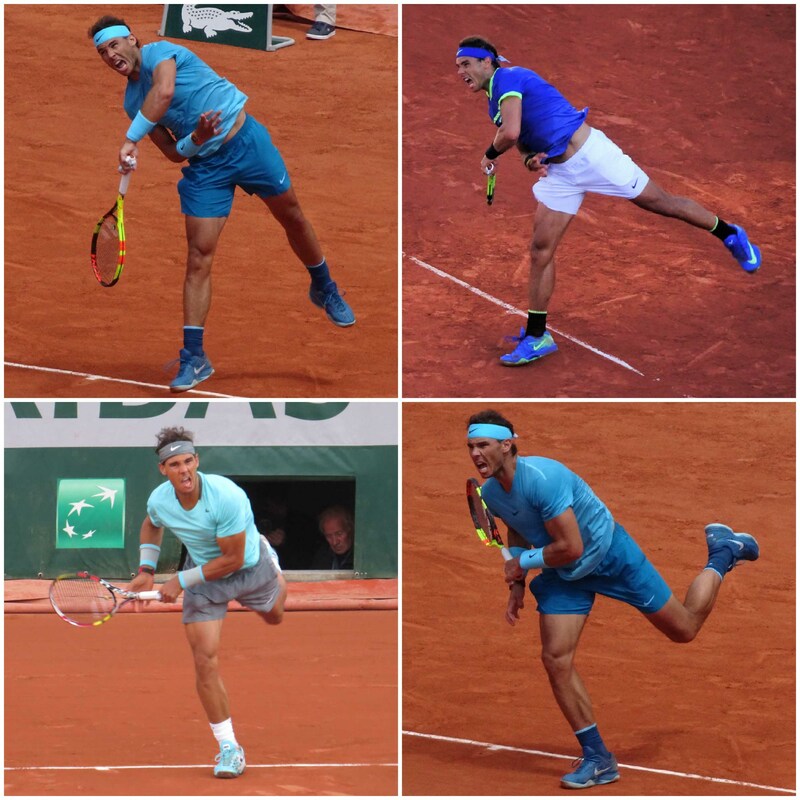 Three years after his last victory at Roland Garos (2015 beaten by Djokovic, 2016 withdrew after injury) I watched Rafa romp to victory without dropping a set in the entire tournament. 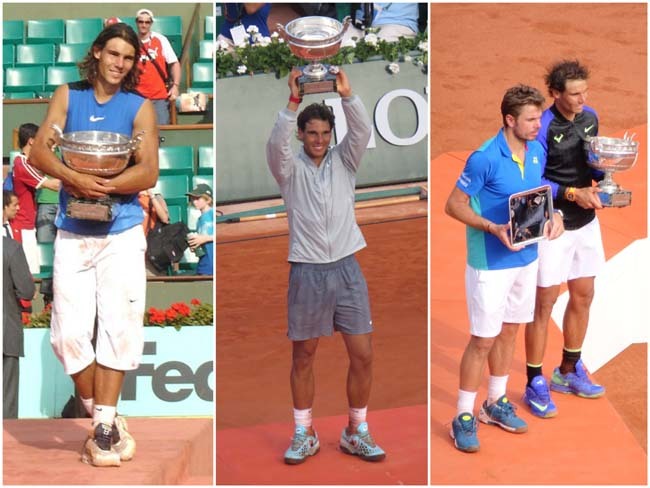 In the final, Stan Wawrinka, the 2015 Champion, was hardly able to lay a glove on Nadal, such was his dominance and Rafa had achieved the unprecedented and unimaginable ‘La Decima’ (the tenth) and in fact dropped only 35 games in 7 matches and 21 sets of tennis, which was fewer than two games per set. He became the first player in the Open era to win one of the four major titles 10 times and at the end of the tournament his record over 13 years at Roland Garos was 79 wins and two losses! So now it was Federer 18 and Nadal 15 in Grand Slam victories but the object of Federer’s decision to by pass the clay season was solely to prepare for the grass season and an 8th Wimbledon title and after a surprising defeat to Tommy Haas at Stuttgart, Federer won the Halle tournament for the 10th time in his career and, in late June, we were on our way to Wimbledon, a tournament which for various reasons outlined here I rarely attend, although I am British and my family has a home in London. I much prefer to buy tickets in advance and watch my tennis at Roland Garos and Melbourne each year to join the absurd six hour queue at Wimbledon. Surprisingly enough it was Nadal who displayed the best form in the early rounds until he was ambushed by Gilles Muller who played the match of his life to win 15-13 in the 5th set. Nadal indeed never knows when he is beaten. And Yes, after a damp squid of a final, Roger Federer won his second grand slam of the year and a record 8th Wimbledon against a blister stricken Marin Cilic and in doing so became only the second person after Bjorn Borg to win Wimbledon in the Open era without dropping a set. The North American hard court circuit was not so lucky for Federer who injured his back when beaten by ‘Sasha’ Zverev in the final of the Montreal Masters and subsequently withdrew from the Cincinatti Masters to ensure he was fully fit for the US Open, but Juan Martin Del Potro again beat him in New York, this time in the quarters, rather than the Final as in 2009. This left the way clear for Rafa Nadal who won his third US Open. Novak Djokovic and Andy Murray were both non starters. So four Grand Slams in 2018 and Fedal was far from limited to the Australian Open Final as between them they swept the board! Although Melbourne was the only time they met in a Grand Slam all year Fedal had reigned supreme as Federer and Nadal took two titles apiece. Each took three Masters events but it was Nadal who at 31 became the oldest to end the year ranked number one and indeed the first ever aged over 30. Nadal set all sorts of records in doing so being the first player to hold, lose and regain the world year end world number one ranking three times and the first to finish the year end number one four times in non consecutive years. Nadal was also the first to become year end number four years after he last achieved the position and the nine year gap between 2008 his first number one season and 2017 his latest was also a record. These statistics are surely a testimony to his perseverance and determination and the fact that Nadal and Federer were taking the game of tennis into previously unchartered territory. But surprising and unexpected as 2017 was as far as Fedal was concerned it was not to end there, because Roger Federer successfully defended his title at the 2018 Australian Open in Melbourne! This was the first Australian Open I had missed for four years and Federer was a heavy favourite with no Andy Murray in the field and both Rafa Nadal and Novak Djokovic returning from injury. The draw was kind to Federer but that was not his fault as he can only play those who are the other side of the net and it was generally considered he did not play as well as the previous year but with Nadal being unable to complete his quarter final fifth set against Marin Cilic, it was indeed the Croat who Federer faced in the final in a repeat of the 2017 Wimbledon final. This time Federer won in five sets and in so doing set his own slew of records becoming the first male player in history to win six singles titles at two separate Grand Slam tournaments. It was a record sixth equalling Australian title and at 36 Federer became the oldest Grand Slam winner for 46 years and the time between his first (Wimbledon 2003) and latest Grand Slam titles was a new record of just under 15 years. 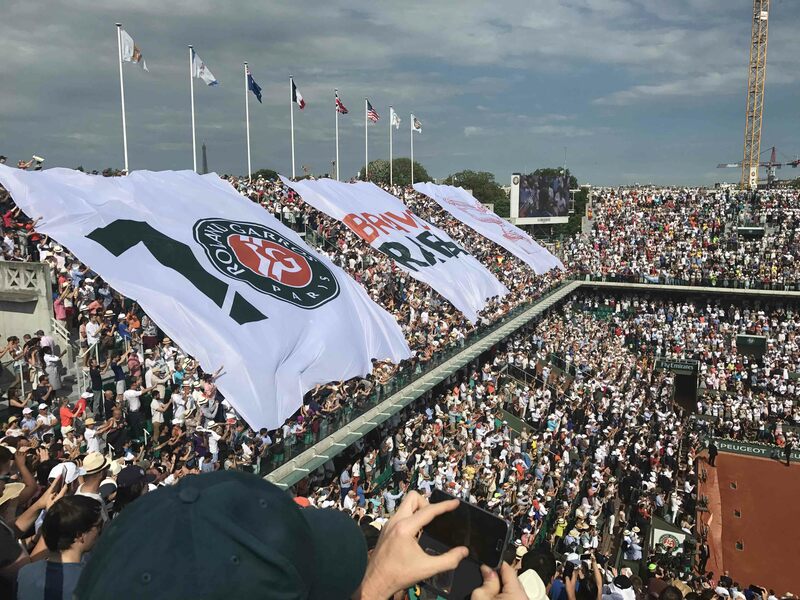 And now it was 20 – 16 in Roger’s favour as far as Grand Slam titles was concerned and in February he regained the world number one ranking just over 14 years after he first held it which was another record. However after failing to defend his Master’s titles at Indian Wells and Miami, the number one ranking reverted to Nadal and Federer announced he would again repeat his 2017 strategy of missing the entire clay court season to be fully rested and prepared for Wimbledon and the grass. The focus was now back on Nadal who was fully expected to dominate the Clay court season as long as he was fit and fully recovered from the injury that forced him out of the Australian Open. 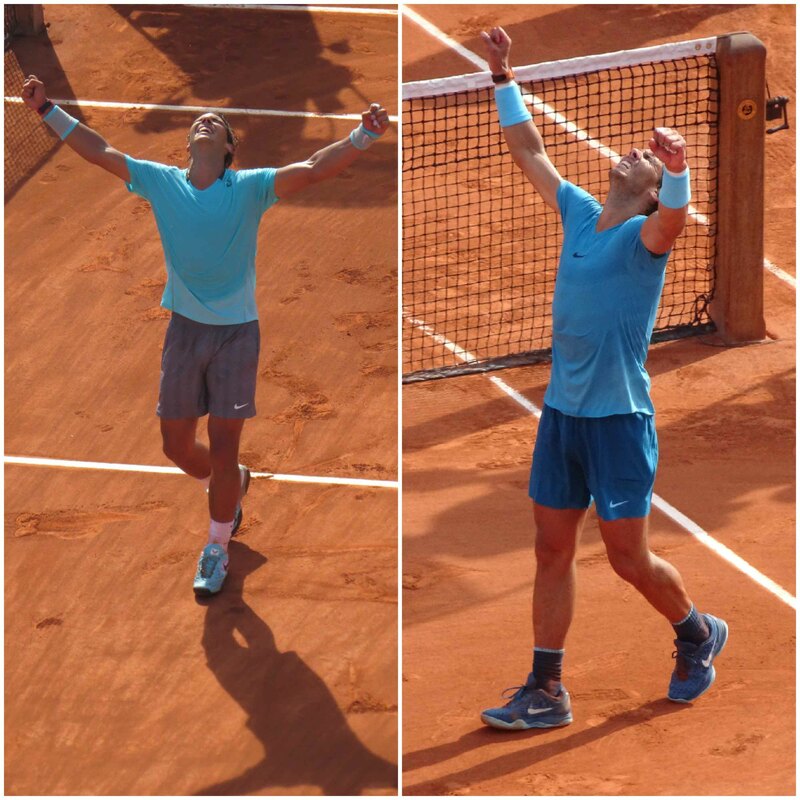 And a successful return to action against a strong German team in the Davis Cup followed by a successful defence of his title at Monte Carlo, on both occasions without dropping a set, showed that the King of Clay could well go through the Clay court season unbeaten. He subsequently defended his title at Barcelona but was defeated by Dominic Thiem in the Quarter Finals at Madrid thus ending a 21 match and record 50 consecutive sets on Clay. By failing to defend his Masters Title at Madrid, Nadal relinquished his number one ranking to the inactive Roger Federer , only to regain it in at Rome the following week when he won the Italian Open, perhaps a touch fortunately in a rain interrupted final. This was the 8th time Nadal had won the Italian Open and a record breaking 32nd Masters title. 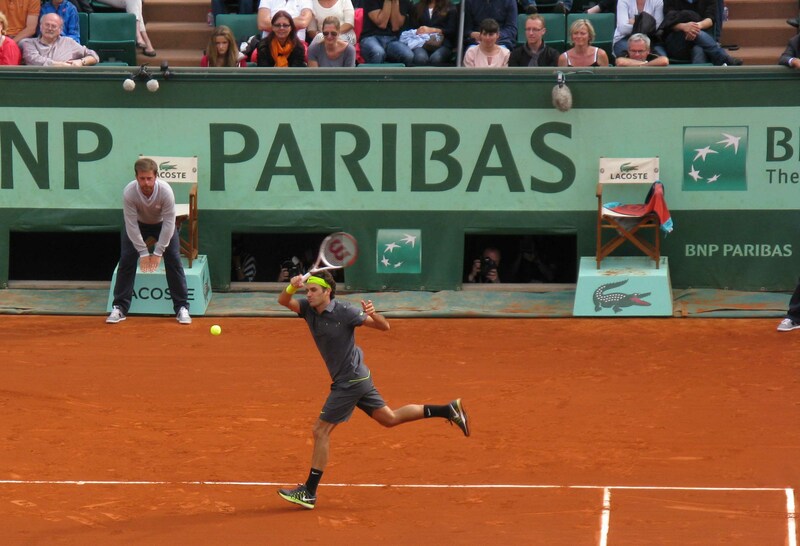 So the stage was set for the French Open as Nadal attempted an 11th title from 14 appearances. As he withdrew with an injury in 2016 he had only lost twice at Roland Garos since he first appeared in 2005. I have followed Tennis betting for almost 40 years and never before seen the favourite for one of the major championships be odds on (Nadal was 7/10 to win all 7 matches and retain his title) and in a way Nadal had everything to lose and nothing to gain as everyone fully expected Rafa to retain his title. In truth he had a very kind draw as the other half of the draw contained all the principal threats including ‘Sasha’ Zverev, winner of the Madrid Open who came close to defeating Nadal in Rome and who is widely considered the most promising of the emerging players, despite yet to progress past the third round of a Grand Slam tournament. The other half of the draw also contained Dominic Thiem, the only player to defeat Nadal on Clay during the past two seasons (Rome 2017 and Madrid 2018) and his old nemesis Novak Djokovic who held a 26-25 winning advantage over Nadal although 16-7 in Nadal’s favour on clay. And clearly he felt some pressure as he both dropped his serve early and was taken to a third set tie break by both Simone Bolelli in the opening round and by the relatively unknown Max Marterer in the fourth round. Nervy stuff indeed for the writer as I had backed Nadal to win the tournament without dropping a set. I will remind readers that Nadal has set the bar incredibly high for himself because anything less than winning every match in straight sets would be considered a failure by many. Nevertheless the reality was that even if with some indications of doubt Nadal still reached the Quarter Finals without dropping set in his four matches. 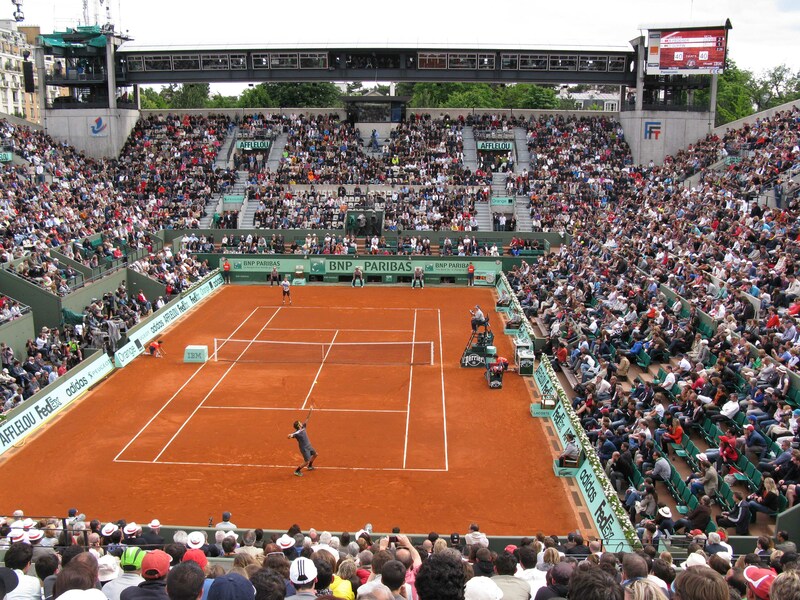 I was at the French Open for the 11th time in the last 14 years and I was not alone in feeling that Nadal was feeling the heavy pressure of expectations this was confirmed by another nervous start against the Argentinian 11th seed Diego Schwartzman. 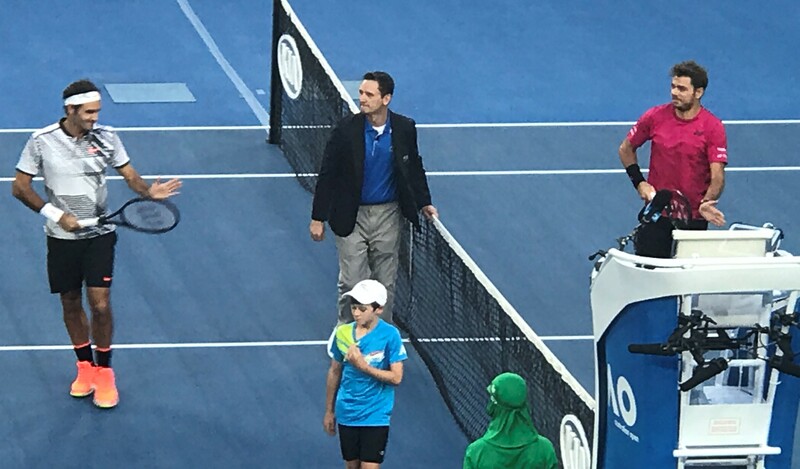 In damp overcast conditions which did not suit Nadal, Schwartzman ranked in the low hundreds just 16 months ago when I watched him play in Melbourne, refused to be cowed and despite being one of the smallest players on the circuit, matched Nadal shot for shot, often triumphing in the longer rallies by thundering a powerful winner past Nadal on a perfect length. Winner after winner flew past Nadal who looked visibly rattled and Schwartzman did not falter taking the first set (so much for that bet!) and then breaking Nadal twice in the second set to take a 3-2 lead. During the second rain break I checked the odds and Nadal had eased significantly from 3/10 to 11/10 to win the tournament. (£100 wager would now return £210 rather than £130 for those not familiar with odds!). Everything I had seen to that point told me Schwartzman was about to pull off a shock victory over ‘The King of Clay’ but my heart told me Nadal would find a way. There is no other tennis player I would trust to play for me if my life was on the line so not without a shadow of doubt I messaged our son in London to put £100 on Rafa at 11/10 to win the tournament and, after an hour’s break, play resumed. Nadal had clearly composed himself and the extended delay had halted Schwartzman’s momentum, errors crept into his game and by the time play was suspended for good, Rafa had broken back twice and was serving to level the match with a 5-3 lead in the second set. When play resumed in the morning it was dry and sunny, and Nadal quickly secured the second set and then the next two 6-2 6-2. Without a doubt the interruptions to play had worked in Nadal’s favour and his vulnerability in the early part of the match had to give his opponents encouragement. Juan Martin Del Potro the number 5 seed, 2009 US Open winner was Nadal’s semi final opponent. The injury prone Del Potro had been injured in Rome and was considered a doubt for Roland Garos but had been playing impressively and had only dropped two sets in reaching the semi final. He had dispatched Marin Cilic, twice a grand slam finalist in the last 12 months, in straight sets in the quarter final and had a decent record against Nadal who led their head to heads 8-5. Del Potro is one of the most popular players on the circuit both with other players and spectators and on his day and injury free is capable of beating anyone but Rafa was back on song and ran out an easy winner 6-4, 6-1, 6-2. 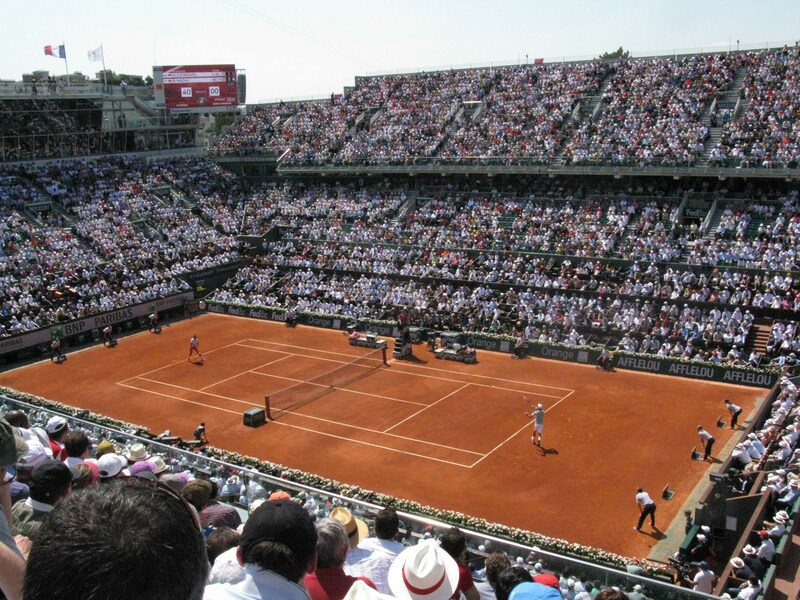 So on Sunday June 10th Rafa Nadal was appearing in his 11th French Open Final and his opponent the player many consider to be his heir apparent on Clay, the Austrian Dominic Thiem who defied convention by playing and winning the tournament in Lyons in the preceding week to Roland Garos. And of course only Thiem had beaten Nadal on Clay in the past two seasons. 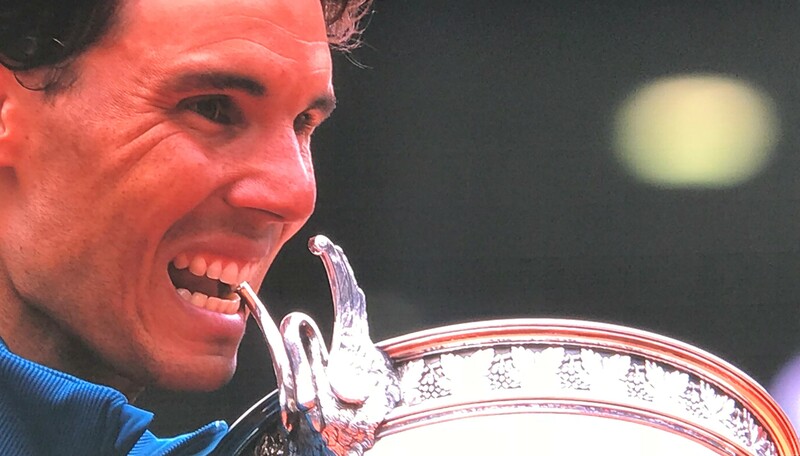 But holding off Nadal over five sets at Roland Garos is a different proposition to best of 3 in a Masters tournament and so it proved, with Rafa securing his 11th French open from 11 Finals in straight sets. In the aftermath and presentation, Nadal looked relieved rather than triumphant or happy and indeed he had everything to lose and was always expected to win. The reality was he had played seven matches, won them all, only dropped one set and beaten two of the best players in the world in his final two matches without dropping a set. Nadal has now won 11 finals out of 11 at Roland Garos and his record at Roland Garos stands at 86 wins and two losses from 88 matches! But clearly the Clay court season had taken a lot out of him – 27 matches played and 26 victories and for once both in his public announcement and Press Conference there was unusually no commitment to return next year. Personally I take this as a reflection of how drained he was, rather than any significant thoughts of retirement when he is four years younger than Federer. Federer also stated he was considering returning to Roland Garos as he would like a final crack at Nadal on Clay before he retires. And meanwhile that stunning and totally unexpected Renaissance in both Roger Federer and Rafa Nadal’s careers that was born at Melbourne in January 2017 has turned into an unchallenged dual hegemony over 6 successive Grand Slam tournaments. Fedal is proving to be an era and not just a single match. As I pen these closing comments with Wimbledon 2018 rapidly approaching, for which 36 year old Roger Federer is a very short priced favourite, I am wondering why this new era of Federer Nadal dominance has re-emerged a full decade after it first occurred. Firstly lets not forget the obvious – these are not arguably, but almost certainly, the two finest Tennis players of all time. It is impossible to compare players in any sport across the ages but probably only Laver, Borg, McEnroe, Connors, Sampras and Agassi are players who are deserving of comparison with Federer and Nadal because quite simply the depth of talent and standards of speed and fitness required in earlier eras were much lower. As a result, players from earlier eras did not have the opportunity to develop both their all round game, technical skills and levels of fitness to the standard required in the past 50 years. So I have no doubt Tennis enthusiasts of the last 15 years have been treated to the unique spectacle of the two greatest players of all time playing at the same time. And I have no doubts that Noval Djokovic with 12 Grand Slam titles is fully deserving of being ranked in the top 10, if not top 5 players of all time. It is Andy Murray (3 Grand Slam titles) who has surely drawn the short straw because in any other era he would surely be compared with a Lendl (8), Wilander (7) Edberg (6) or Becker(6). As well as his two Wimbledon and single US Open victories he has five times been the beaten finalist in Australia and once at the French Open each time being beaten by one of the greatest players of all time – Federer or Djokovic. In any other era Murray would have won a multitude of grand slams and rightly be considered as one of the all time greats. The last 10 years has for the first time ever seen four of the all time greats playing simultaneously and Nadal and Federer the two greatest players in history have had to sharpen, refine and take their games to an even higher level. So perhaps the answer to how and why the era of Fedal has re-emerged is simple and straightforward – cream always rises to the top and in January 2017 both Roger Federer and Rafa Nadal had regained full fitness after their injury blighted 2016 and the only players who could realistically challenge them on an ongoing basis have both been plagued by a series of career threatening injuries (Andy Murray) and injuries allied with loss of form and confidence (Novak Djokovic). So in fact logic and expectations have been turned on their head. Most tennis observer’s have understandably predicted that Nadal’s game built on energy, power and a determination perhaps unequalled in the world of sport, let alone tennis, would curtail the length of his career and that age would eventually catch up with Roger Federer leaving the way for Novak Djokovic and Andy Murray to dominate the Grand Slams for at least a couple of years. But it is in fact Djokovic and Murray whose careers appear to be faltering first! And is there no one else who can challenge Fedal? Of course any of the top 50 Mens Players can play the game of their life when Federer or Nadal has an off day and prove victorious but at the present time it appears no one can stop them except each other! At the time I write these words Roger Federer is 36 and Rafa Nadal is 32, an average of 34. In terms of tennis I consider a ‘generation’ to span perhaps 5 years and clearly of their contemporaries only Djokovic and Murray, both 31, and the talismanic Stan Wawrinka (33) have been able to challenge Fedal. But what of the generation following? Only Marin Cilic and Juan Martin Del Potro, both 29 and with a single US Open victory apiece, have been able to muster a serious challenge at the highest levels. The ever popular Del Potro, yet again rebuilding his career after a serious injury, is always capable of beating anyone on his day and Cilic, more consistent now than at any stage of his career, is clearly the 3rd best player in the world when the chips are down. Of the rest Milos Raonic (27) just does not have the game to win a Grand Slam, Kei Nishikori (28) has the game but not the heart (sorry Kei!) and whilst Grigor Dimitrov (27) certainly has the all round game to win multiple Grand Slams, his game appears to be in decline, although he did win the ATP Masters in London last November. For sure the generation following the top 4 has not been able to muster a consistent challenge to their elders, but if we look at the next generation based around the age of 22, do we see a more credible challenge to the dominance of Fedal? Dominic Thiem at 25 is probably more suitably grouped with the younger players and is widely considered the best clay court player in the world after Nadal and indeed has beaten Nadal in both 2018 (Madrid) and 2017 (Rome). Alexander Zverev (21) is most people’s pick as tennis’ next superstar but has struggled to get into the last 16 of a Grand Slam before the recent French Open. Nick Kyrgios (23) is probably the most talented of the younger generation and has the talent, power and all round game to beat anyone and indeed was the youngest player to have managed to beat Federer, Nadal and Djokovic but his biggest challenge is not lack of ability but of application, and staying injury free. Hyson Chung (22) has given plenty of indications he could become the first Asian player to win a Grand Slam but perhaps it is Denis Shapovalov (19) who is the most talented of the younger players on the circuit. But the reality is that at present there is no one on the circuit capable of challenging Federer and Nadal in regards to sustained ability. Yes there are several players capable of raising their game and beating a below par Federer or Nadal but there is no one in sight who can combine an all round game with the mental determination necessary to be a consistent threat. The three players who have proved they can challenge Federer and Nadal all have their own problems with injuries (Murray and Wawrinka) or in recovering form and confidence after injury (Djokovic). So at present it is difficult to look beyond Federer and Nadal as far as Grand Slam titles are concerned. And for Roger Federer in particular it is quite simply amazing that he can maintain the level of fitness and dominance that he is currently displaying at the age of 36. We are quite literally seeing a page turn as we watch someone rewrite the rules of expectation in regard to performance being constrained by age. 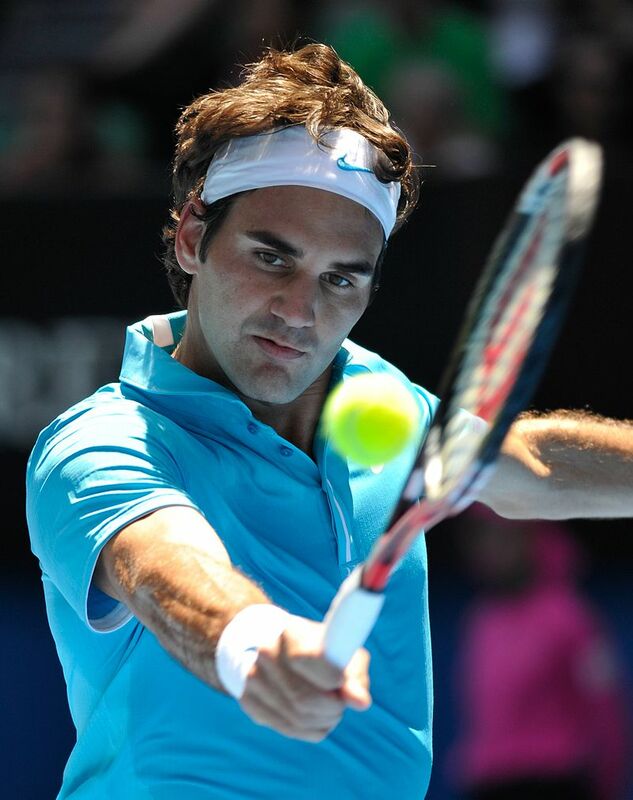 Roger Federer is not defying logic but he is showing the logic is wrong and needs to be rewritten. As well as taking performance and ability to a new level throughout his career, he is now defying age, rewriting the rulebook with careful management of training, diet and a restricted schedule, to be winning Grand Slam tournaments at an age when 95% of his contemporaries have long since retired. Roger Federer is widely considered to be the greatest player who has ever picked up a racquet, yet throughout his career, when he looks over his shoulder who does he see but Rafa Nadal. 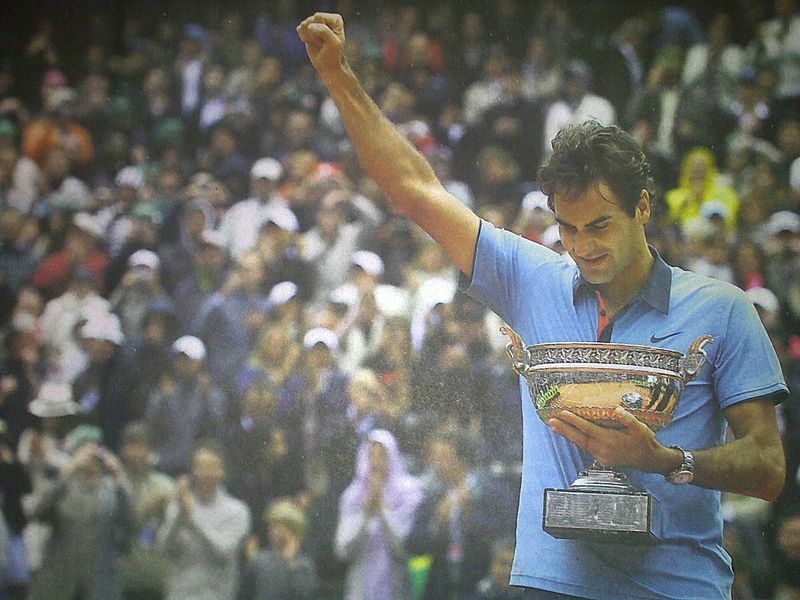 Federer wins three Grand Slam tournaments at the age of 35 and 36 and lo and behold Rafa also wins three! The totals are now 20 to Federer and 17 to Nadal and one would normally expect Rafa to be playing for two or three years longer after Federer stops but with Roger stating he wants to play until he is 40 who knows how long Nadal can and will want to keep up his relentless and totally committed game or should it be how long his body can survive the demands he makes. I have long thought that Rafa Nadal would at some point overhaul Federer’s total of 17 Grand Slams which was where Roger was ‘stuck’ from July 2012 to January 2017 and indeed Nadal’s’s own resurgence has seen him match Roger with three apiece over the past 18 months but I am no longer so certain that Nadal will outlast Federer. Many people still describe Nadal as a clay court specialist and with 11 French Opens the facts speak for themselves but I have always thought such comments are a grave disservice to Nadal. No one in the Open era has ever won all four Grand Slams twice and Rafa has three times been a beaten finalist in Australia, the one Grand Slam he has only won on a single occasion. In fact he has twice been a break up in the final set in Australia so has twice been within a hairs breath, and closer than anyone else, to an unprecedented first Double Career Grand Slam. If that is not the mark of a truly great all round player, I don’t know what is and there is no other player I would trust more to play for my life if the chips were down. And whilst we are looking at Fedal and how and why these two great players have reasserted their dominance over Men’s Tennis at an age when they would be expected to go into decline, it would be remiss not to leave you with one final thought and observation. 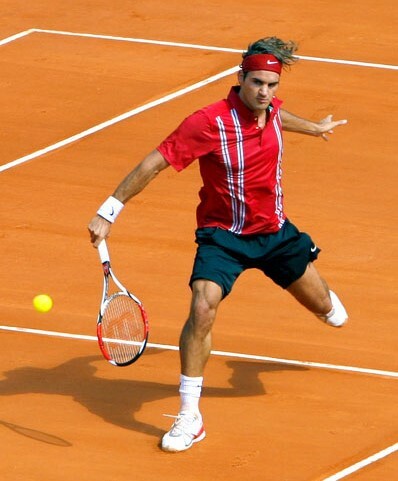 Roger Federer is widely considered to be the greatest male player of all time. But Rafa Nadal still has a significant 23 -15 lead in their head to head contests and that includesthe recent 5 consecutive victories for Federer,! So does that make Nadal the greatest of all time? Of their 12 meetings in majors, Nadal has won 9 of them. 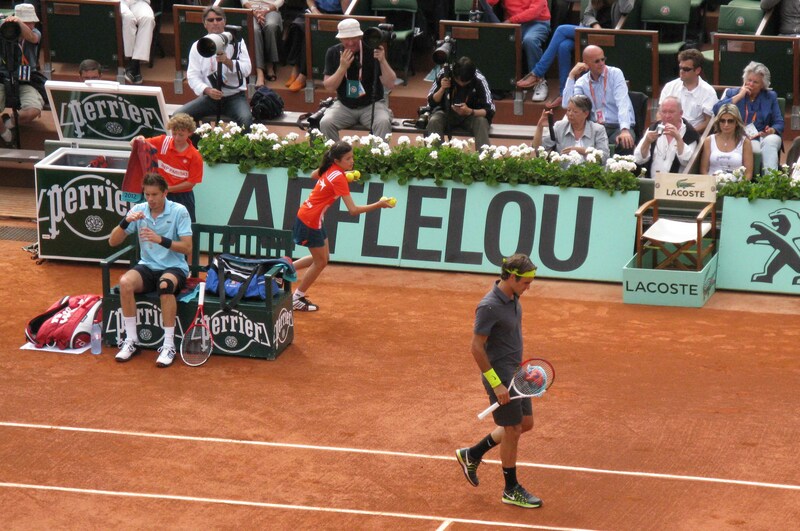 In Grand Slam finals, Nadal leads Federer 6–3. 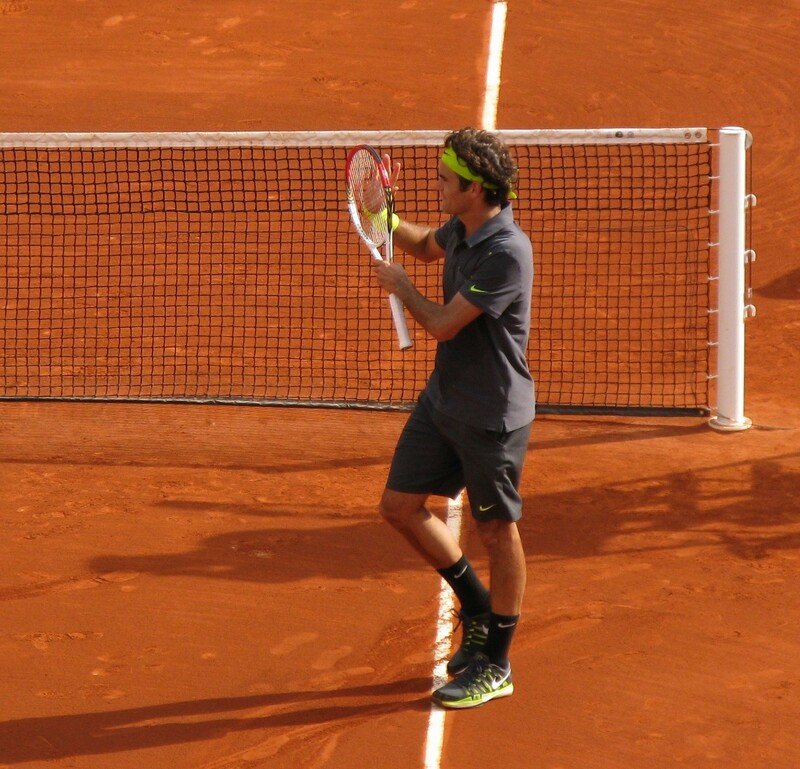 Nadal leads on clay (13–2) while Federer has the edge on both hard courts (11–9) and grass (2–1). If nothing else I am sure you will agree that the evidence they are the greatest male tennis players that the game has ever seen..
As I finish this article there is 7 days before Wimbledon 2018 starts and after his surprising loss to Borna Coric in the final of the grass tournament at Halle Federer has eased in the betting to 2/1 and Nadal who has not played since the French Open is 8/1. They can only meet in the Final as they will be seeded 1 and 2 and I suspect this will not happen as Federer has not been as convincing this year as 2017 and Wimbledon could offer a chance to one of Cilic, Del Potro or Kyrgios if Nadal fails to shrug off the effects of a tough clay court season. In 2012 I wrote here that Federer would fail to win another Grand Slam, only to have egg on my face when he won Wimbledon just weeks later, so I am loath to make any more predictions. But if Fedal have now won 6 Grand Slams in a row (as well as a record setting 11 in a row between them from 2005 -2007) and if I feel that Roger might trip up then the 9/1 Nadal looks good value and so I have backed him together with smaller wagers on Kyrgios at 18/1 and Del Potro at 30/1. Whether or not Fedal prevails for a seventh consecutive Grand Slam there can be no doubt we have been doubly privileged to watch the two greatest players in history compete at the same time over the last 15 years. When they won every Grand Slam between them in both 2006 and 2007 who could have possibly conceived that we would see them repeat the feat in 2017. In many ways tennis is the ultimate sport, being the only one that combines stamina, speed and touch and it is one on one sport with no team members to let you down and no coach alongside with tips and advice. Tennis is perhaps the sport which poses the ultimate physical and mental challenges. 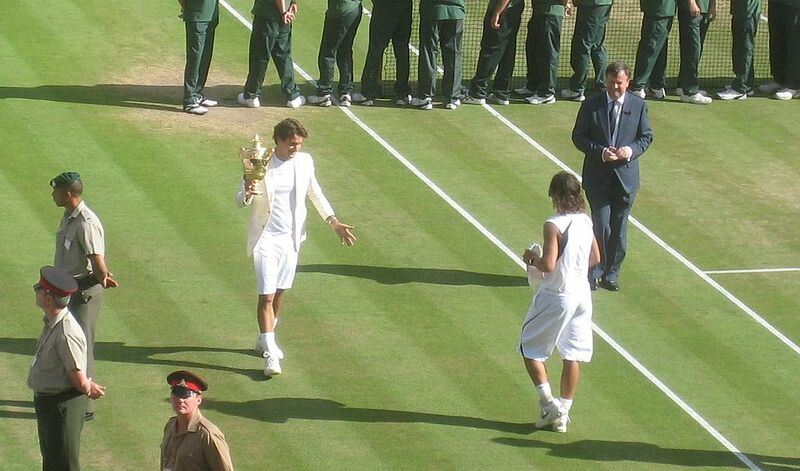 Roger Federer and Rafael Nadal are quite possibly the two pre-eminent sportsmen on the planet in terms of what they have achieved Theirs is an unparalleled achievement and both are humble, gracious in defeat and generous in victory and great role models. Enjoy them whilst you can because we will not see their like again.